Good care and maintenance are vital in preserving a violin, whether or not the instrument endures frequent travel or gets handled often. All instruments need regular cleaning and attention, and much of it can be done at home. 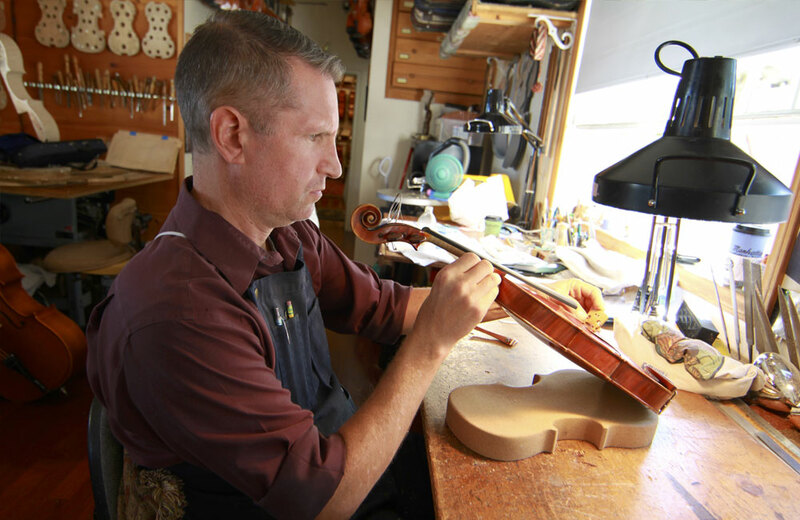 Every so often, an instrument should also be taken in to the local violin shop for a more thorough cleaning, restringing and bridge adjustment. Rosin is the solid form of resin used to obtain grip while bowing. During playing it rubs off the bow causing rosin dust to accumulate on the instrument’s surface and strings. Rosin dust damages the instrument’s varnish and care should be taken to wipe it away with a cloth after each playing. Care should be taken to wash hands before playing, and touching the violin should be minimized beyond the chin rest, neck and fingerboard. The violin should be wiped lightly with a soft, lint-free cloth after every playing. Still, oil and sweat can build over time and will need to be cleaned to avoid damage to the varnish. In most cases, it is recommended to bring the instrument to a violin shop where the instrument can receive a thorough cleaning by a trained professional. 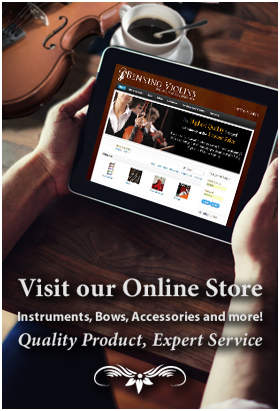 Lint-free cloths can also be found at an online violin store. Replacing strings is necessary as the acid from sweat and rosin slowly degrades the quality of the strings over time. Though many violinists replace their strings themselves, it is safer to have a professional do it, as the loosening of strings can affect the pressure of the instrument, causing the sound post to move or fall out of place. For a bridge to last a long time, it needs to be inspected regularly and straightened as needed. Place two fingers from each hand on either side of the bridge, and adjust the bridge with the thumbs. Violin owners who do not feel confident about bridge adjustments should bring the instrument to their local violinmaker for adjustments.